If you were to inventory your attic right now, chances are you’d have the same old stuff everyone shoves up there: Christmas decorations, leftover pieces of carpet or tile, and the box of old yearbooks your mom made you take with you when you finally moved out. Then there’s retired tax collector Jacques Bellanger, who kept a mummified head in his. 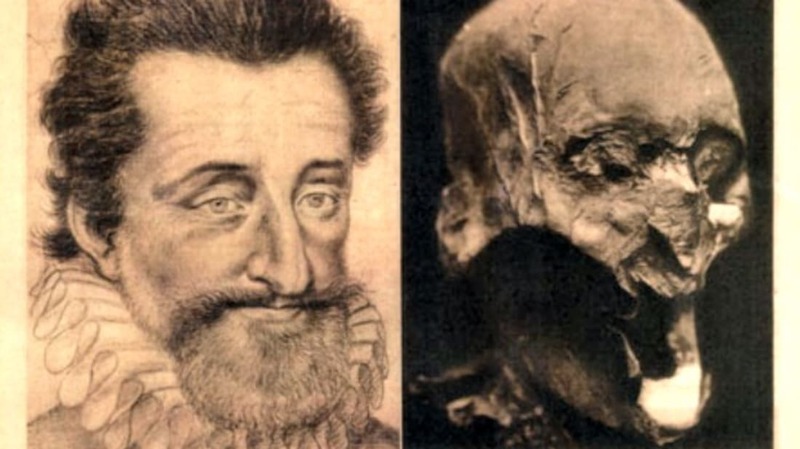 The head was believed to have belonged to King Henry IV, a French royal who was assassinated in 1610. Henry’s head was still attached to his body when he was stabbed to death in 1610 … so how did he come to be separated from it? While we don't know for sure, historians believe revolutionaries removed it as a political statement when they ransacked the Basilica of Saint Denis in 1793. After that, the head was passed around to various private collectors for more than a century. The trail picks up again in 1919, when a photographer purchased it for three francs, and then again in 1953, when Jacques Bellanger added it to his collection. It was removed from Bellanger’s attic in 2008. “We don’t have any DNA, but we can manage without it,” said a forensic medical examiner on the research team brought in to analyze the remains at the time. “We have too much proof supporting the identification, at least 30 factors, and none of it goes against the identification.” Some of that proof included skull injuries that matched injuries King Henry had, as well as a distinctive mole on one of the nostrils. Facial reconstruction also supported the theory. However, when the DNA testing did eventually come through in 2013, results disproved the head-of-King-Henry theory: A sample taken from the remains didn’t match samples taken from three of the king's living descendants. Despite the apparent lack of royal lineage, officials planned to give the unidentified head a proper burial. That may take a while, as people are still unsure about the accuracy of the DNA tests. But if it’s not King Henry’s head, that means his skull is still out there somewhere. When was the last time you cleaned your attic?